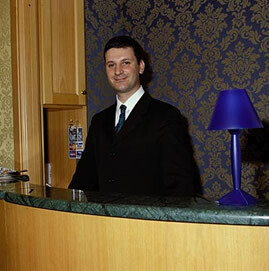 Welcome to the Piazza Di Spagna View Guest House Rome, one of the most comfortable and best located guest houses in the enchanting Eternal City. As the name suggests, many suites at the Guest House Piazza Di Spagna View boast stunning panoramic view of Piazza di Spagna and Spanish Steps. Guests residing at the Guest House will enjoy staying close to many of the best known sights and landmarks of Rome: the Colosseum, Trevi Fountain and the verdant Villa Borghese. All are best visited on foot, enjoying the amazing Roman architecture, monuments and fountains that adorn the streets of this part of the renaissance city. The Piazza di Spagna View is also extremely close to Spagna metro stop providing quick underground access to all the other sites of Rome. 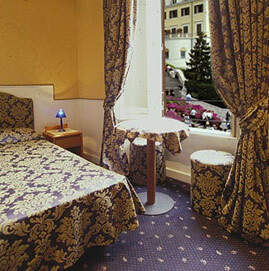 Visit the Piazza di Spagna View Location page for information on our location and how to arrive at the residence. Fashion conscious guests will take great pleasure strolling down the stylish cobbled streets surrounding the Guest House where numerous world famous boutiques are located. 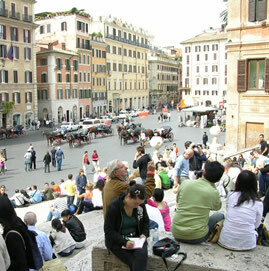 Piazza di Spagna View guests can rub shoulders with the rich and famous regularly spotted shopping in the area. The piazza was home to the famous English romantic poet John Keats, who was attracted by the gratifying warm Italian climate and the elegant Piazza di Spagna. 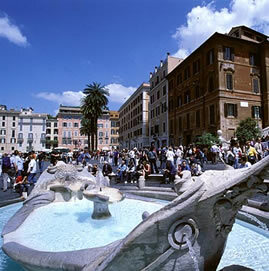 Visit the Piazza di Spagna and Spanish Steps page for further information on this unrivalled square. All rooms are clean, comfortable and are equipped with the necessary amenities. They include air conditioning, television and bathroom. Visit the Piazza di Spagna View Suites and Services page where you can view the rooms and find information regarding the type of rooms available and the facilities provided. To check room availability or book a room immediately, consult our Real Time Reservations page. The best possible rates are guaranteed when you deal directly with the Piazza di Spagna Viewand watch out for special deals available throughout the year. The Piazza di Spagna View Useful Links page provides handy information regarding travelling around Rome and Italy.